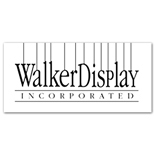 Walker Display has been manufacturing a picture hanging system and a portable exhibit system since the 60’s. First established in Duluth, MN it has now been in use all over the world. Without the people behind Walker Display and our customers, we would not be here. We thank you for reading this and please call 800.2234.7614 or visit us at Walker Display.com if you have any questions.